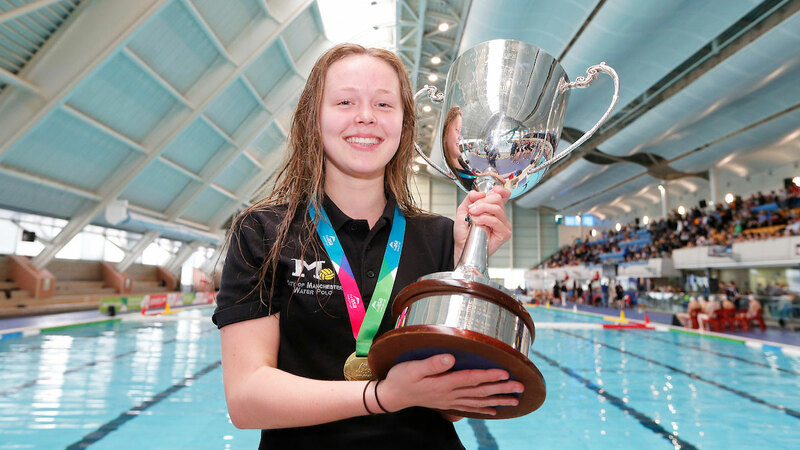 City of Manchester held off a resolute Exeter side to lift the Girls’ U17 title at the ASA National Age Group Water Polo Championships 2016. Playing in front of a packed-out crowd at their home pool in Manchester Aquatics Centre, City of Manchester held an advantage throughout the four quarters, ultimately running out 13-8 (5-2, 2-1, 1-3, 5-2) winners. We played so well as a team and I think we deserve it. Victory ensured Manchester lifted their seventh title in the Girls’ U17 division and their first since 2013. And Manchester sharp-shooter Annie Clapperton, who bagged a double hat-trick in the final, including three in the crucial fourth quarter, insisted it was no less than they deserved. “It feels so good to lift the trophy,” said Clapperton. “We’ve played so well as a team and I think we deserve it. “We were winning and then it got close again but then we pulled it away and worked together well in that last quarter. It was Clapperton who started the ball rolling for Manchester in the first quarter, opening the scoring with a penalty then finding space close to net and pushing home. Isabel Larder also scored twice for Manchester in the opening quarter, helping establish a 5-2 lead. Exeter burst out of the blocks in the second quarter, peppering the Manchester goal with shots, only to see two bounce off the crossbar and another two drift agonisingly along the goal line without ever crossing. Katy Cutler – a constant threat for the South Coast side – netted her second of the game, but it was Manchester who stole momentum at the end of the quarter, with Steph Whittaker putting home a rebound and Clapperton showing her class to fire into the roof of the net from 5m. Exeter’s pressure finally began to show in the third quarter, with a double save from goalkeeper Abbi Smith proving the catalyst for a second-half comeback. Cutler added another two to her personal tally, while Jade Stickland also found the net for Exeter and it took heroics from Niamh Campbell O’Donnell in the Manchester net to keep her team’s noses in front. With the tie hanging in the balance at 7-6, Larder gave Manchester some breathing room heading into the final quarter, completing her hat-trick with a smart lob to extend the lead to two. A frantic start to the final quarter saw both keepers saving from point blank range, before Clapperton stepped up with a two-minute hat-trick, ending Exeter’s hopes by handing her side a five-goal lead. Both teams netted two more in the closing stages as Manchester held out to lift the title. Rotherham Metro won the Girls’ U17 bronze medal after a 5-2 defeat of last year’s champions London Otter.